Luckily, my generation of Oregon Trailers know to question what we hear, so when many of us read the popular tip of flat ironing our braids to create perfect waves, we were skeptical. A few tried it and confirmed that its efficacy was matched only by Cara Delevigne’s morning-interview congeniality. Which is to say, it doesn’t work. Instead of braiding, just take two small sections and twist them together like a rope [see right], then flat iron the twist. Obviously, the bigger the sections, the wider the wave, just like when you curl. Let them unfurl naturally to keep them polished, or brush them out for a beachier wave. However, you should still try flat ironing your braids! Why? Straightening actually helps widen out the braid and make it look really pronounced, polished and perfect. It can help simulate that tennis-shoe-loosening thing we all do where we tug out the braid to add volume, but without losing the polished look. Straighteners can also help with crown braids and the like that are meant to lay perfectly flat against the curve of your skull. Seriously, try it. You will be addicted at flopping around your picture-perfect ultra-smooth flat Pollyanna plaits. Try it with your mer-braids! Need a flat iron recommendation? I’ve been playing with this Revlon rose gold plated one (only $30! ), which not only looks classy as heck but has some interesting science behind it. My go-to fave straightener hasn’t changed in a long time – it’s the Sedu. This thing is ah-mazing. Ok i HAVE to try this… I love big, pretty perfect braids. So hot right now! For sure Cheyenne! Now I just need more hair to braid. Thanks for reading! I’m going to give that twisting technique I try! I had never heard of this technique and was wondering how everyone gets those perfectly coiffed crown braids! Will def be trying soon – thank you! Genius! I’m going to try the twist for waves and flat ironing braids for a polished look! Awesome. Thanks!! Cute, cute cute!!!! Can’t wait to try! This is awesome! I had no idea you could do this. I’m definitely trying it out with my hair. I’m always looking for great ideas like this to freshen my look. I want to try a braid too, my hair is just getting long enough now – thanks for your tips! If your braids are too tight you can slightly pull at them to loosen them up a bit. 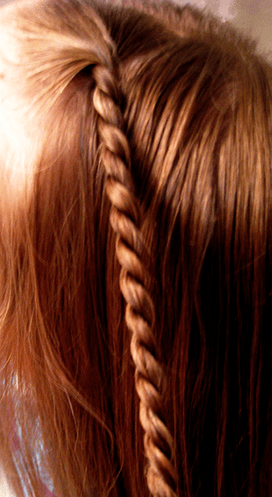 You want to do this by closing your flat iron on different parts of your braid.